Summer and always hot and finding a place to cool off is very hard, particularly if you have kids. Splish Splash is a lot of fun, but it can be difficult to get to if you live in Nassau County or in western Suffolk. 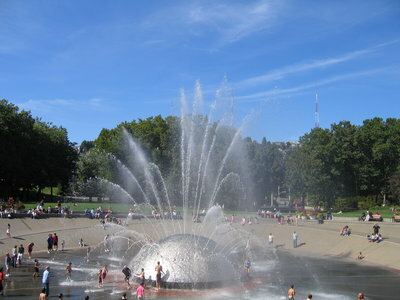 Sprinkler parks are a great way to get the family cooled off while having a lot of fun. Many of the locations are in local parks already. Sprinkler parks, or spray parks, are a unique form of entertainment in a hot summer. Many locations on Long Island are part of our town parks or town pools. Not all sprinkler parks are the same. Some are interactive with the children to control and spray water at each other. Other locations include water slides and other great amenities. Dozens of sprinkler parks exist on the island. So, go and check a few of the locations out. Some of these parks may have fees or are only for residence of a particular town. Please check the fees before venturing out for your day trip. Long Island’s only waterpark is a great location for not only sprinklers, but for exciting water slides and a lazy river. This adult and child friendly park will give your family a full day’s worth of fun. Splish Splash has been a summer spot for many Long Islander and they are always updating the park. This summer, Splish Splash introducing their new water ride Bootlegger’s Run. East Meadow, Merrick and Stewart Ave. In one of the three playgrounds in the park, located on the Hempstead Turnpike side of the park, the largest playground for children include a sprinkler park in addition to the other amenities at the park. After skating around the outdoor roller rink and playing in three different age-level playgrounds, you can cool off in their a spray-pool. With a seating area for parents that overlooks the playground, your kids can cool off while you enjoy the ambiance of the park’s beautiful flowers. With a picnic area and food service, this park will fulfill all you need for a great day at the beach which includes an interactive spray park. Please note that this is a Babylon residence only park. With its fishing pier, this park is a one stop shop for your day’s entertainment which includes an interactive spray park. All your waterpark needs are in this pool. In additional to an interactive spray park, this pool includes a children’s pool, interactive pool, and double slides. Don’t feel like getting wet? Relax with your e-reader or tablet with their free Wi-Fi. This 25,000 sq.ft. playground features massive artificial trees, a 100-foot play bridge, and 25 spraying sprinklers. Cow Meadow Park is host to 150 acres of marine wetlands and features a wide variety of amenities. Between the toddler swings and the playground there is a large spray area perfect for staying cool on a summer afternoon. Hoyt Farm is fun for the whole family all year long. During the summer months their playground even turns into a sprinkler park! Conveniently located next to the Bay Shore Marina, Shipwreck Cove is a spray park featuring sprinklers and a large waterslide.